This monthly budget post looks a bit different than usual because I didn't buy anything fashion or beauty-related this month. I've done some in-person and online browsing at many of my go-to shops, mainly when family visited for graduation, but I didn't see anything I liked. Also, I dined out considerably more than usual while showing family members around the city, which left very little room for a shopping budget anyway. 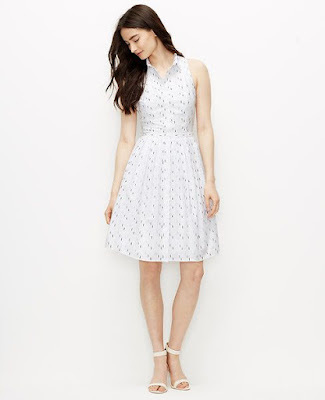 I purchased some gifts for others, and I added the pictured Ann Taylor dress ($77.40 on a 40% off promotion) to an order to get free shipping on the gifts. I don't record online purchases against my monthly total until I've received the item and decided to keep it (unless it is final sale). Although the dress is objectively quite cute, I strongly suspect it will not be a keeper for me. I tried on sizes that didn't work in the store, and I found it to run quite small in the chest relative to other AT items. It is 100% cotton with no stretch, which means that I could need to size up two sizes from my "average" AT size, which could leave the waist baggy. The yoke neckline/tapering at the upper armhole is also likely to emphasize my chest in a way that's not flattering. I'm also contemplating some purchases from the Paula's Choice sale (referral link) to replace items when they run out, but I'll wait until June. All in all, I'm actually a bit shocked that I haven't shopped this month. It isn't too surprising: I went from the exam period to showing family members around NYC to graduation and then straight on to packing and moving. There wasn't time. In past busy times though, I've often looked to online shopping as partial stress relief, without really thinking about how other expenditures for the month affected my ability to shop. Linking up with Franish and the other budgeting bloggers this month as usual! Franish graciously answered some of her readers' questions about her budget in this month's post, which provides a very real look at how she manages her finances as a medical student. I've seen that dress on some other bloggers, and it does seem like it fits better on smaller chests. Could it be worth having it tailored at the waist if it does fit in the chest? Spending nothing without actively trying not to ban yourself is awesome! I'm supposed to be on a ban...it didn't work out for me. Oopsie! If it looked like it would look good after the alterations I totally would! My online order actually arrived yesterday and I got to try on the dress in my size. Alas, I do think the design tends to make chests look a bit wider, so I decided that it wasn't for me! I definitely have trouble committing to not shopping, even in unusually busy months. In my case, I think its partially that I really did shop a lot in earlier months (January through March especially, and also in November and December) and had already purchased everything I want for the summer. It might be a while before I think about what I want for autumn. I'm really impressed that you were able to not shop this month! I've been thinking about doing a no-shop month, but then again I might be setting myself up for failure, haha. I am very, very surprised too. Although I will try to keep my shopping at a bare minimum for the next few months, I probably won't have another no-shopping month again for a while! In truth, I'm not sure that actually committing to a no-buy month would help me. This month was largely because of being too busy (with a little bit of added awareness of how much I was spending on restaurants).